But we quickly realised – for properties for sale, this wasn’t good enough. When buying a property you care about more than how many restaurants there are in the area, and how good the transport connections are. Buying a house is probably the largest purchase of your life, so there are lots of investment criteria to think about: Is it a fair price? Will it appreciate? And how much could you rent it out for? We’re thrilled to announce that we’ve added this information to the properties for sale listings. We show you the nearby properties for sale, with the same number of bedrooms. The properties are plotted on a map, so you can immediately get a sense of how much property values are in the area. How much could you rent it for? Similar to above – we show the nearby properties to rent, with the same number of bedrooms, on a map. We’ve also calculated the gross rental yield, so you can get an idea of whether it would cover your mortgage. Even if you plan to live in the house, it’s good to know just in case! Map showing nearby properties to rent. Makes estimating rental yield easy! Property in London is super expensive. We’ve said it many many times before. Therefore the rental yield in London is fairly low. Instead, investors may make the bulk of their return due to the property going up in value – capital growth. When you read about London property prices growing faster than anywhere else in the country, this is what we’re talking about. So how much will your property go up in value over the next few years? Obviously no one can be sure. Nobody knows what will happen to London (let alone your street) over the next 5 years. But you can make a better guess by looking at how the houses prices in the area have gone up over the last 5 years. 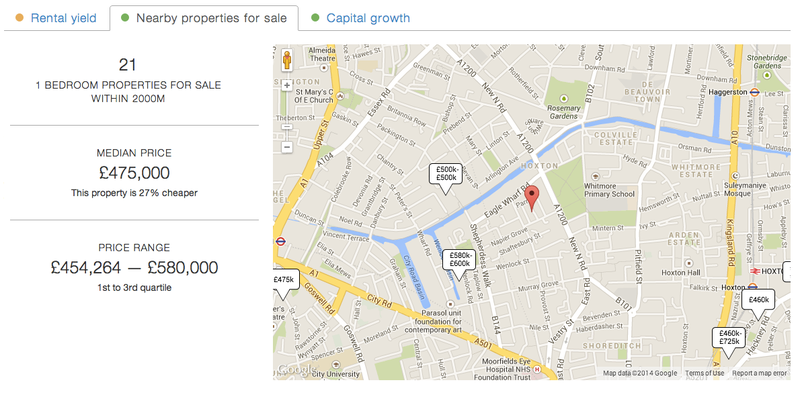 And so we’ve built a really cool widget (right on the property for sale pages) that will do this estimating for you! Historic sold prices for properties on the same street (and area). This gives an indication of how this property is likely to appreciate. We’ve used historic sold prices from the Land Registry. This is the same data that other property sites used, but we’ve been slightly cleverer with it (in our not-so-humble opinions). We track the appreciation of individual properties (i.e the price growth between when they were bought and when they were sold). The growth rates for each individual property are then combined to form an average for the street. We think this is a much better measure than tracking the average price for an area, which is what other property sites do. The average sold prices are skewed by the type of properties sold, as the Land Registry doesn’t distinguish between a run down studio and a 12 bed mansion. By looking at individual properties we avoid this bias. Please, take it for a spin! As always we really value your feedback, and good luck property hunting. This entry was posted in Moving to London, New features, Prices and tagged buying property, property for sale, property in London, Real estate. Bookmark the permalink.